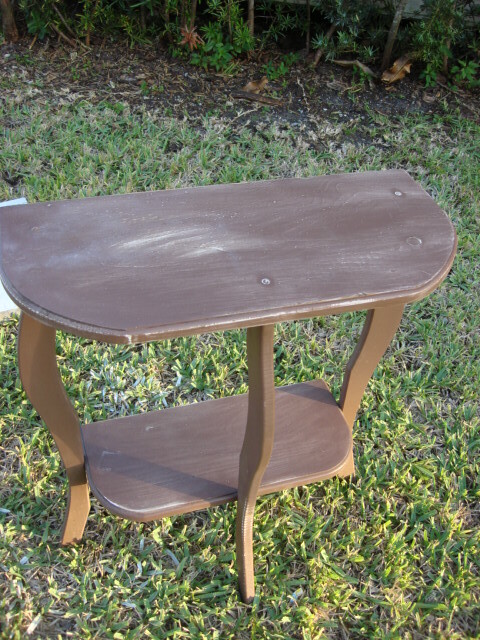 I found this little table on the side of the road a couple of days ago. I jumped out of car, stuffed it in the trunk, and drove off as fast as I could. Considering it was a block away, I didn't want anyone to see me. It was dirty! I think it was being used as a plant stand. I gave it a good cleaning and a light sanding. 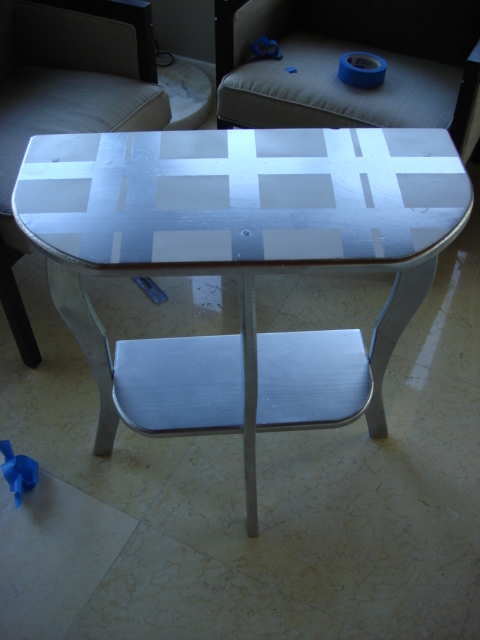 I spray painted a metallic silver. I'm not the biggest fan of metallic spray paints, they are so unforgiving. 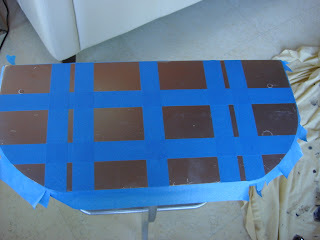 I thought of doing another chevron print, especially after doing my chevron tray, but I figured I'd change it up a bit.﻿ I did a random tape design and taped up the edges to leave the trim in the silver finish. I spray painted the top white and was left with this. When I say the silver spray paint is unforgiving, it was not looking very even. So I decided to distress it a bit. I've never tried this technique and actually had no idea what I was doing. I sanded the edges a bit stronger and then just randomly sanded the top. 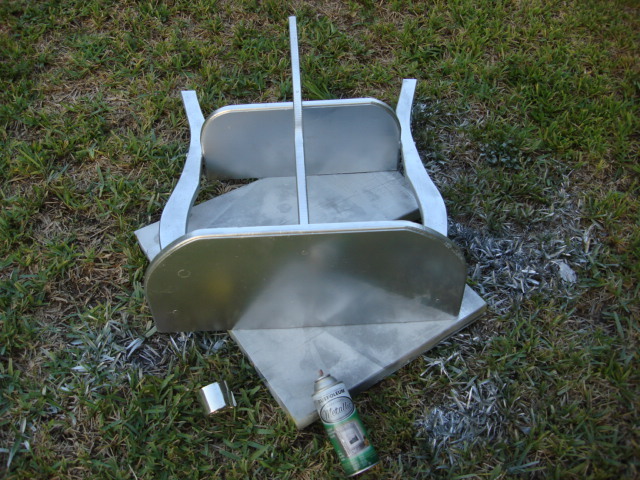 Sanding the silver spray paint was kind of weird. It was giving a scratched look, not really the look I was going for. 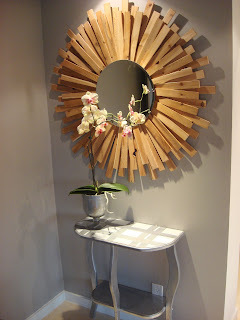 Here it is with my DIY mercury glass vase and my sunburst mirror. I don't think I would actually keep this in my house, but I'm trying to learn some painting techniques before we attack my sisters furniture. Total cost of this project $0.00. What do you think? Have you distressed furniture before? What am I doing wrong with the spray paint? I would have skipped the silver spray paint...I don't think it really suits this piece of furniture. But how do you learn unless you try, right?! I would've gone straight for white paint and either distressed it from there or dry brushed it with a grey or brown paint. I've got a tutorial on my blog for dry brushing if you're curious. 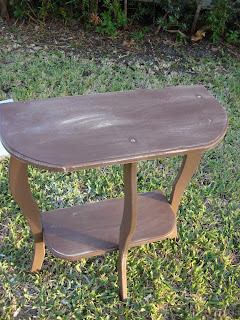 http://icantstopcrafting.blogspot.com/2011/04/refinishing-wooden-candlesticks.html Hope this helps! Nice Project!! I am in desperate need of doing a bigger craft project. I love the furniture shape, I love that you found it on the curb, and I love that you were stealthy about grabbing it! agree.. don't think i'd have attempted the silver spray. however, the distressed white/grey would work. or better yet.. go for bright pop of color to update the style of table & coordinate perfectly with your sunburst mirror! 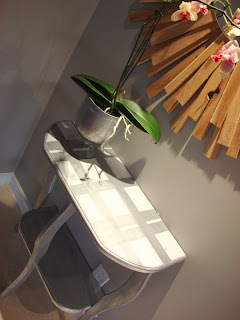 Yes, the table is great but I really covet that fabulous mirror! I think the whole look comes together kinda cool. I agree, you never know until you try! Look at you with all of your DIY projects! Rock it, girl. That mirror is wonderful! Would love for you to link it up to The AFTER Party this month! I'm not digging the stripes but I love how that table and that mirror and plant looks together. Perhaps a mirrored top? I know, just a suggestion. I think you did a great job! 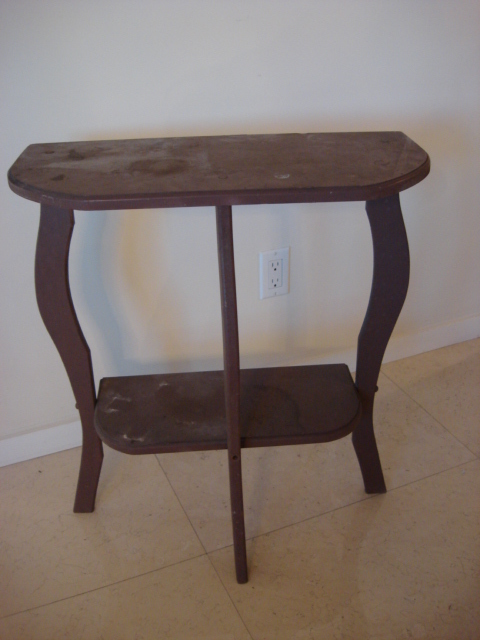 What a great find, too; you can't beat a curbside find for practicing on. 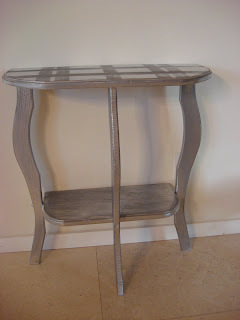 I've not distressed any furniture I've painted either. The only thing I want to try on a few pieces is adding glaze and I've got my fingers crossed on that! I think it looks fabulous! Great job! OK the only things I find curbside are things I don't want to touch! This is so awesome! So glad you linked it up. What a great little table! You gave it a whole new life and I think it looks fantastic! I love the touch of silver. Thanks so much for linking this up to Inspiration Friday this week! I am surprising with the furnishing side of those furniture, which wood is used in it! Your table came out adorable! What a lucky find! Love this! I have a new linky this would be perfect for stop by and link up would ya? What a transformation! Great tute :) We would ♥ for you to show this off at our link party! I like the design you used on this piece. What about if you did the same thing just using different colors, as in picking from the colors of that little lumbar pillow on the couch? 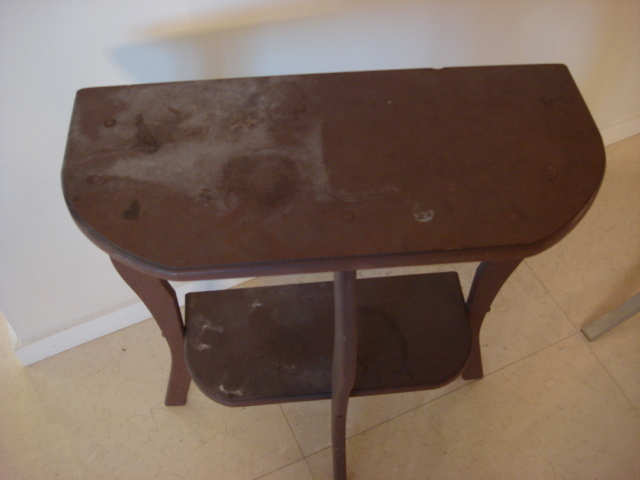 Love the table and your vision to see past the beaten up beginning! But I must say, your commenters are among the most unkind I've ever seen on a blog! Wow. Harsh. Once again I am stunned at what people put out on the curb! I can picture you jumping out to quickly retrieve it! 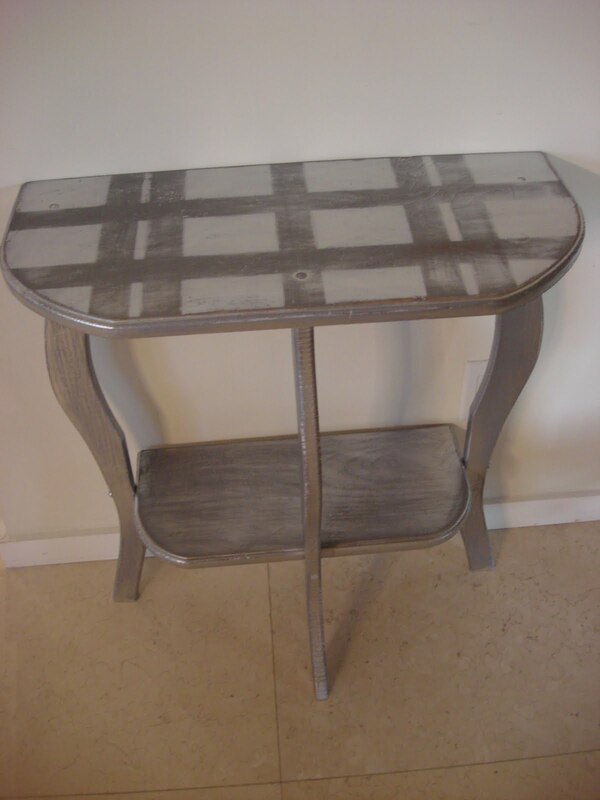 Love the way you painted it -- nice job! Hi there! Just wanted to let you know I featured this as part of my BFF link party wrap up!! Please feel free to come grab a button from my sidebar! 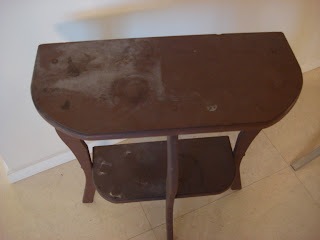 Your table turned out cute! Very bold choice to paint it silver. If you really hate it you can repaint it, but maybe just live with it a few weeks to see if it grows on you. It's already grown on me! ooh it looks awesome! and i looove your mirror you made! Wow, it looks TOTALLY different! in a good way ;) I love free finds, they're the best!! I found your blog from Cassie's POWW. Come visit me if you'd like! !